Palmitoyl Tripeptide-5, Panthenol, Sodium Hyaluronate and Algae (Dunaliella Salina) Extract. 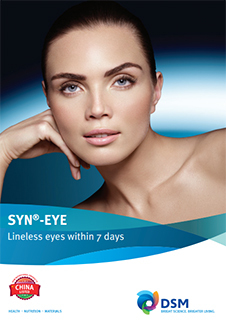 SYN-EYE® by DSM acts as an anti-aging, anti-wrinkle, skin texturing and smoothing agent. It combines the latest SYN®-peptide technology with superior bioactives in a multifunctional eye care formula. It visibly reduces the appearance of lines and wrinkles around the eye within 7 days and also reduces the appearance of dark circles. After only 14 days, visibly brightens the skin around the eye contour. SYN-EYE® improves the skin’s texture and moisturizes, protects and energizes the skin around the eyes. Used in wide variety of facial care and eye care cosmetics. Listed in the Inventory of Existing Cosmetic Ingredients in China (IECIC). It has a shelf life of 36 months.